This entry was posted in Art Friends, Events, From the World, Openings, Reviews, Wally Workman Gallery on January 29, 2019 by ellenheck. Please join us in Austin, Texas for the opening of Elliptical Thinking. All new work from the past two years, the show includes eight large scale color wheel compositions, several diptych Conversations, and prints from the Fascinators series of allegorical portraits. To read more about the work and the thinking behind each piece, the interior of the show catalog can be downloaded in pdf format here. Wally, Rachel, and I look forward to seeing you in the gallery! This entry was posted in Events, Galleries, Openings, Wally Workman Gallery on October 4, 2017 by ellenheck. This entry was posted in Art Friends, From the Studio, From the World, Work in Progress on June 23, 2017 by ellenheck. 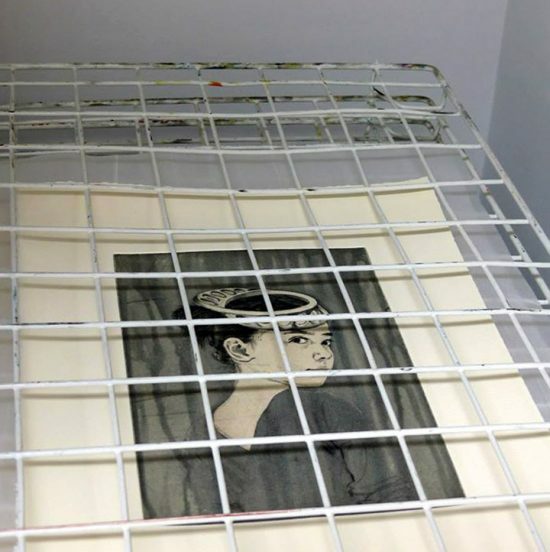 The 11th Biennale de Gravure opens this Friday at La Boverie in Liège, Belgium. The theme of the exhibition cycle is “Dérive(s)” or “Drift(s),” which references the “Dérivation” canal that meets the Meuse river to form the peninsula on which the museum is located. While researching the concept/translation, I was seduced by an extension of the word put forth by Guy Debord describing “a technique of rapid passage through varied ambiances” in which you allow yourself to “drift” (usually through an urban landscape) without a planned destination. It is a way of discovering the world often used while traveling, moving to a new place, or following toddlers all of which I have enjoyed doing in the past two years. While this research impacted choices for color wheels I was painting late summer of last year (particularly Carolina Color Wheels: Drift), the prints in this show are several portraits from the Fascinators series (2016) as well as selections from Lonely Hearts (2014) – both of which take on “drift” from a more psychological angle. Here is a complete list of my fellow printmakers whose work will be on view during the biennial. The opening and ceremony will take place Friday March 17th at 7pm. Ambiance: This building makes me want to check a coat and open a journal. This entry was posted in Events, From the World, Museums, Openings on March 11, 2017 by ellenheck. it’s hard to go the same way twice. We used the poem to inspire thoughts about repetitive practices and making room for chance in the art process. On view are several new color wheel sets created this year in North Carolina and the “sketchbucket” models suspended in a cascade near the opening of the garden gallery. I will be demonstrating the printing process for the next few weeks here on the Art Center’s press, a custom model donated by the well-known Rockport native artist Al Barnes. This entry was posted in Events, Museums, Openings on October 19, 2016 by ellenheck. My own palette is not dissimilar from Heather’s. We both gravitate towards teals and grays, fresh sands, and a guarded, but intentional use of vibrant accents. Moderation in all things – including moderation. For this installation, I chose two Carolina Color Wheels that would hang well with a new series of portraits from 2016, Fascinators, a portfolio of girls wearing paradoxical or mathematical topographic shapes as hats. I’ve written a bit about the ongoing Color Wheels series here. While the process is still the same, the most recent abstract panel groupings have focused more intentionally on trying to describe consciousness, emergentism, and linked thought-related processes. Similarly, the Möbius strip hats worn by the girls in the portrait series are also looking at and attempting to visually solidify thought processes. Overall, four types of printmaking are highlighted in this show. April Vollmer‘s work brings Western iconography to hieroglyphic narrative woodcut scrolls. Jenny Robinson‘s large-scale architectural intaglios combine collagraph with monoprint. Heather Swenson is showing several screenprinted still lifes inspired by collage. 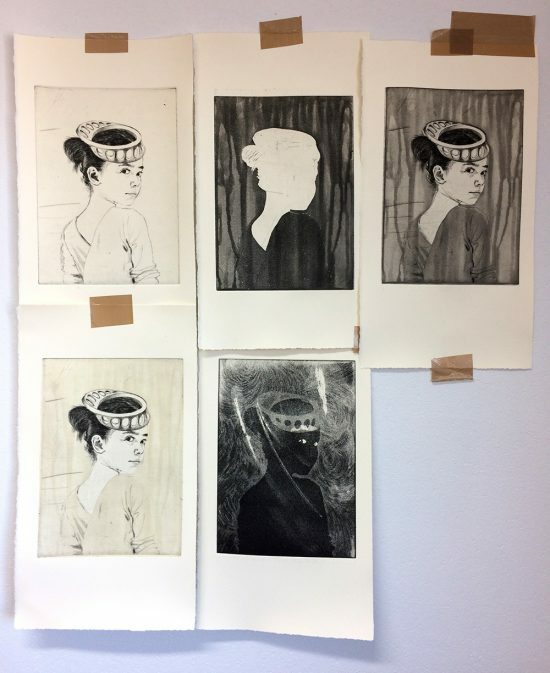 And finally, my Fascinators portraits are each combinations of woodcut and drypoint, while the Carolina Color Wheels mix media with drypoint on copper. This entry was posted in Art Friends, Events, From the World, Museums, Openings on September 7, 2016 by ellenheck. On view in the LAB space in conjunction with the Under Pressure show, a recent collaboration between Graphic Arts Workshop and the Print Club of Rochester presented a diverse group of prints in various techniques from the West and East Coast associations. Two of my favorite prints from the Graphic Arts Workshop happened also to be two of the smallest. Power Moiré by Anthony Ryan (above left) and Three of Spades by Mariko Jesse (above right) were both tiny prints floating in a clean expanse of paper frame. Ryan’s work pulls the viewer close and in, while Jesse’s card-like plate had a milkiness to it that made me want to pick it up off the paper. From the Print Club of Rochester, I was drawn to two pieces for their chromatic cleanliness. Treasure Sun Set by Carol Aquilano is a color reduction woodcut at its boldest, with all the transparency and sticky-edged carving marks of relief as expressive medium, while Katherine Baca-Bielinis’s Philadelphia Charm gives an impressionistic glimpse of a column, an archway and the beginning of an ornate ceiling. It’s as if we are watching these forms develop and vanish as they pass in and out of view – that the viewer might even be necessary to their existence. Finally, a conceptual piece from Adam Werth, president of the Print Club of Rochester. 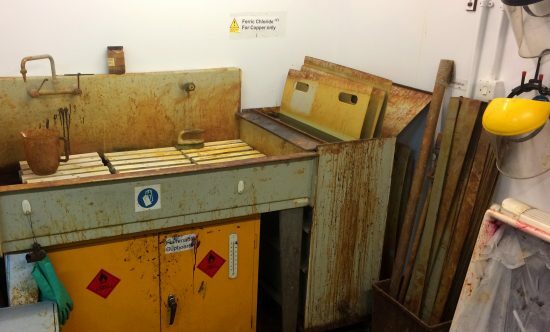 The materials description on the information panel reads: non-variable data, inkjet, collage. It’s a bit of a troll piece as well since the portfolio format dictates that it must stay on top of the print stack for the creases not to flatten or warp the other prints. I currently have this work in my studio – a good reminder on several levels. The title: 😉. This entry was posted in Art Friends, Events, From the World, Openings, Reviews on September 6, 2016 by ellenheck. Orange is the new studio color. 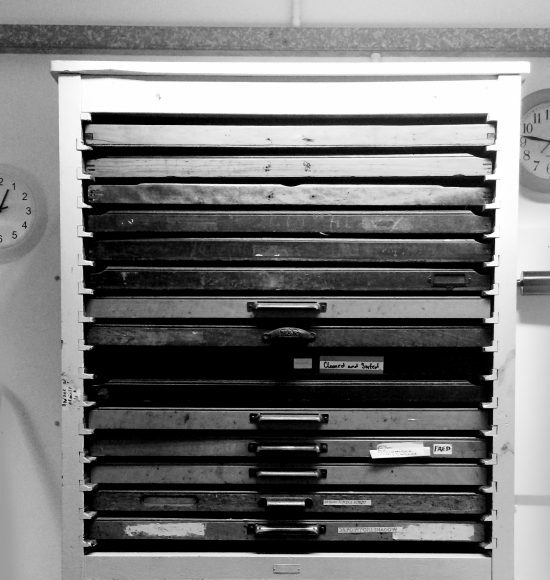 I haven’t yet had time to dedicate a post to the new press, a fiery orange Takach with a 36″ x 48″ press bed. In the meantime, here’s a little still life with some of the more complex möbius models that are accumulating on the frame. 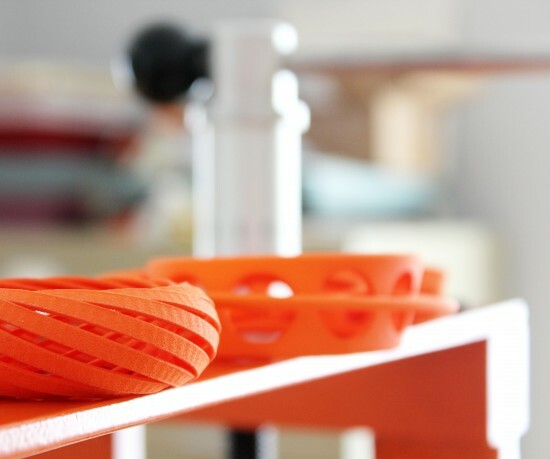 The figure in the foreground is a torus of 12 möbius strips designed by Rick Russ. Behind it, a double möbius with linked circular openings designed by Furquan. This entry was posted in Art Friends, From the Studio, From the World, Photos on February 23, 2016 by ellenheck. Yet portraiture is also a masquerade, a game. Artists have been playing with poses ever since the Renaissance. Today Cindy Sherman does it, as does Ellen Heck, who in her coloured woodcuts gets her friends to pose as Frida Kahlo. They all become Frida for a day. But who is Frida? She herself joins in the game, posing as Leonardo da Vinci’s Lady with an Ermine, who now sports that unmistakable thick monobrow. Portraiture, when you start enjoying its formality and its awkwardness, turns out to be an art of infinite possibility. This a pleasing glimpse of the past’s future. Gill Saunders, Senior Curator of Prints, writes more about her interest in the Fridas for this show in Art in Print. She will be giving a Lunchtime Lecture about Facing History on March 2, 2016. Many thanks to Jenny Robinson for taking these installation shots. This entry was posted in Events, From the World, Museums, Openings, Reviews on August 1, 2015 by ellenheck. 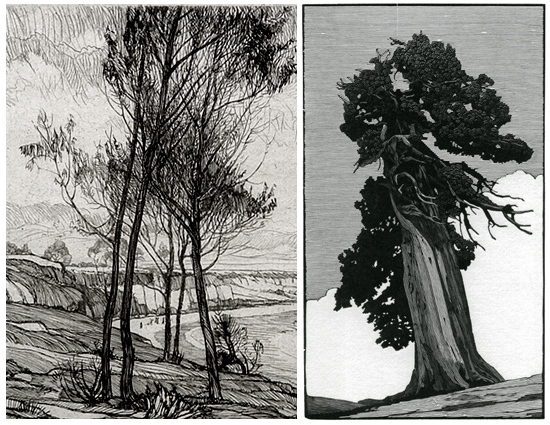 Two California printmakers with lifetime links to the Sierra Nevada are currently on view at Mills College. 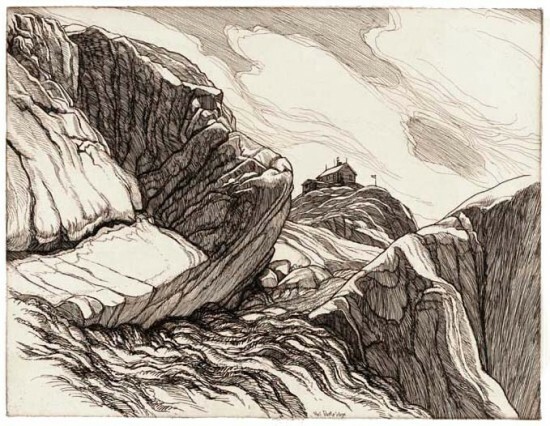 The landscape prints of Roi Partridge (1888-1984) and Richard Wagener (1944-) are sculptural, full of movement, majestic—yet intimate in size. They have both built their imagery though an accumulation of lines. Partridge has etched his deeply into copper. They appear as rich threads of black ink, fuzzy on the paper and raised. The trunks of his trees twist and curl like spirit woods from Arthur Rackham’s golden age Grimm’s fairy tales. Wagener, on the other hand, is composing with a negative line—a precise, white removal of hard wood from an engraved block. His images are solid and iconic. They also show movement, but it seems frozen and rigid as if there is not a breath of wind and the twists of trunks and thrusts of mountains are sculpted from the turbulence of an earlier time. The work of both men makes one want to make a solitary pilgrimage in appreciation of California’s natural wonders. This entry was posted in Art Friends, Events, From the World on February 5, 2015 by ellenheck.